The most hated people on ats are all women, Hilary, AOC, omar, pelosi and or people of color Obama, illegals, refugees, Muslims. talk about placing people in to categories I didn't realize all illegals Muslims and refugees were Democrats. I was thinking of something worse. A good rule of thumb seems to be, when you find a population that makes excuses for terrorism, blames victims of terrorism for the terror attacks, minimizes the fact that their leaders shout BS like "death to the American Satan" in their services, and spends most of their time blaming either Jews or America for their own personal failures and woes.... well, you've probably managed to also identify the actual source of your future terror attacks. Only the western world would be so staggeringly stupid as to elect the same mindset that has attacked your country and killed your citizens into political office in what can only be described as an exercise of "look how enlightened and sympathetic to our tormentors we are!" Stockholm Syndrome, coming to a Midwestern voting district near you. Sounds like you're clumping all muslims into one mindset. "Some people did some things" is not advocating for anti-American policies. A intelligent president would say; "Omar should clarify what she means by her statement and use more precise language when being a representative". Instead we get a president who jumps on board any chance to divide the country. Instead of asking Omar to clarify her ideas on the two videos trump posted, he rather jump to vilify her into a monster. But have fun pushing hate and fear. One video shows her saying a weird general statement about 9/11. The other clip is about how her professor would say terrorists groups with a different mannerism than other things like the U.S. military. Perfect expression how to how this country rather hate the other side than try to understand it before making judgements. 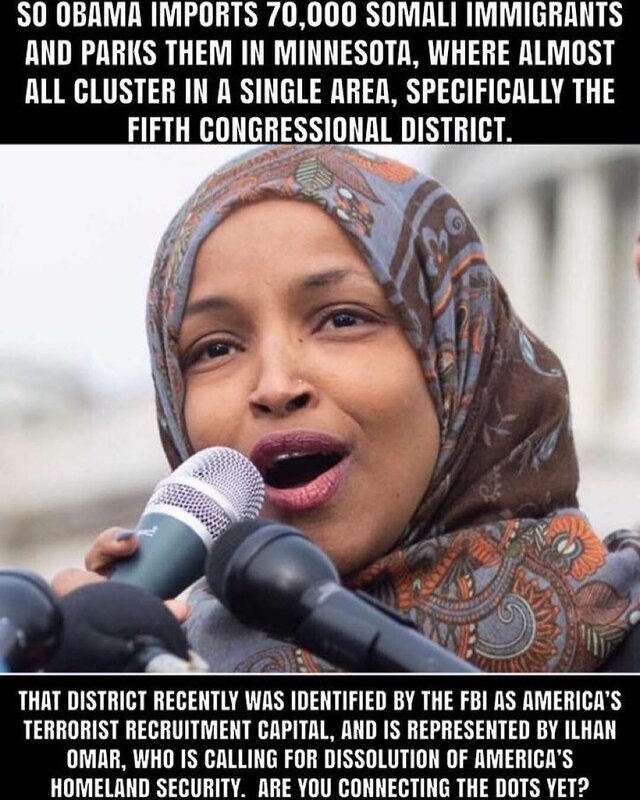 Omar is a disrespectful PO$ that needs to be kicked to the curb of her own country. She could do us a favor though and take some of the trolls in this thread with her.